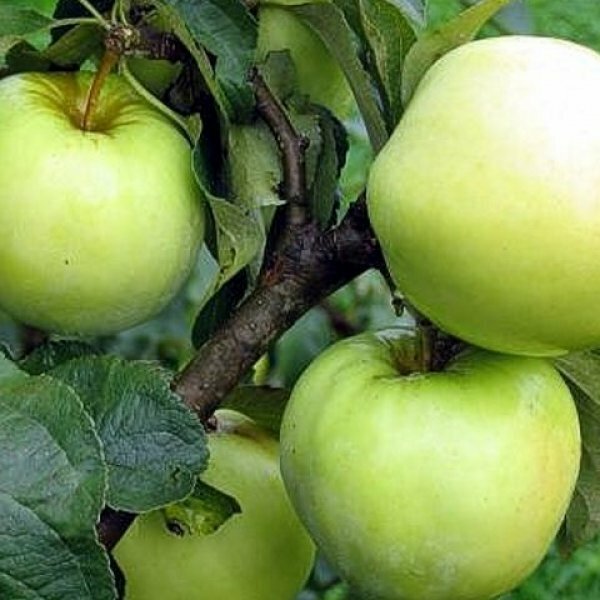 Antonovka is a group of late-fall or early-winter apple with a strong acid flavor that have been popular in Russia (Soviet Union and the Russian Empire) as well as in Poland. 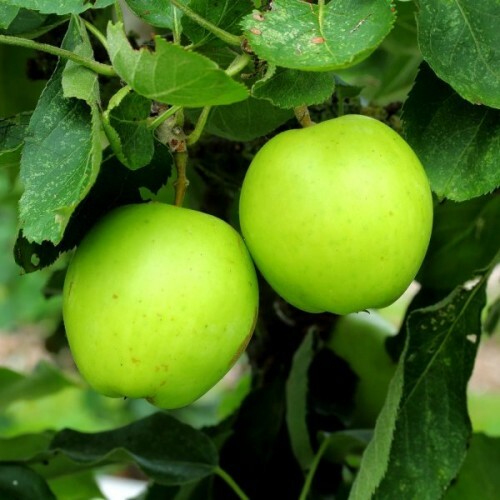 Its popularity is explained by the Antonovka tree's ability to sustain long harsh winters typical for some regions of Eastern Europe and Russia and for its superior fruit preservation qualities. 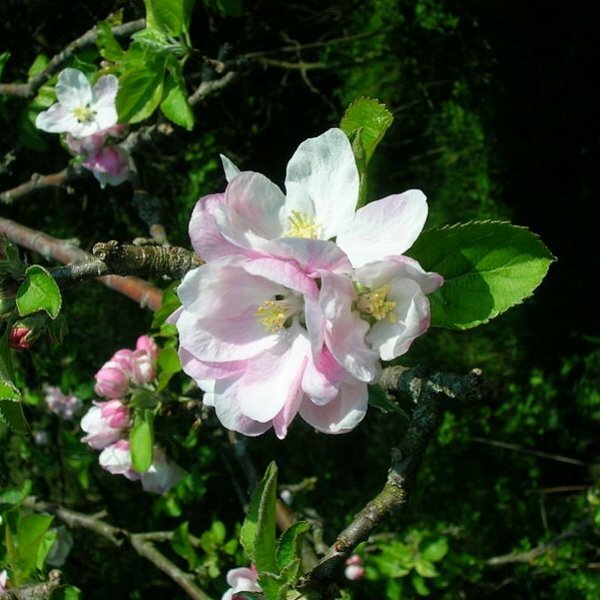 Sometimes nicknamed "the people's apple", the Russian variety was especially popular among the dacha owners, and remains widely grown at dachas in many Post-Soviet states. Due to the relatively low ratio of sugars in the fruit, Antonovka apples are especially well-suited for apple pies and late apple wine. The taste of the wine is noticeably lighter than wine from sweeter cultivars. In Poland, Antonówka is used mostly for apple preserves. A decidious Tree growing to 7 m (23ft). It is hardy to zone 3 and is not frost tender. 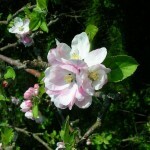 It is in flower in April. It is noted for attracting wildlife. The plant requires well-drained soil and can grow in heavy clay soil. It can grow in semi-shade (light woodland) or no shade.It requires moist soil. Edible Uses: Fruit - raw, cooked in pies, cakes etc or fermented into cider. The taste can be sweet and pleasant. The fruitcan be up to 6cm in diameter. Medicinal Uses: The bark, and especially the root bark, is anthelmintic, refrigerant and soporific. An infusion is used in thetreatment of intermittent, remittent and bilious fevers. The fruit is said to dispel gas, dissolve mucous, cure flux and be atonic for anaemia, bilious disorders and colic. The leaves contain up to 2.4% of an antibacterial substance called 'phloretin'.This inhibits the growth of a number of gram-positive and gram-negative bacteria in as low a concentration as 30 ppm. Germination 1. Soak the seeds in water for 24 hours, to soften the outer layer. 2. Place the seeds in a damp paper towel and then fold it into quarters. Place the towel into a plastic bag and place into the refrigerator. Keep the seeds inside the refrigerator for 60 to 80 days. 3. Sow 2 mm deep in soil. After approximately 6 weeks the seeds should begin to sprout. 4. Plant the sprouts into 6-inch containers filled with a well draining potting soil. Select a container that drains. Be careful not to injure the root system when planting the apple seedlings. Water to keep the soil moist, but not soggy and place the container in a sunny window. 5. When the plant is six months to one year-old, plant it outside in a location situated in full-sun and with well-drained soil. Select a planting site where the tree won't be crowded and gets good air circulation. Constantly wet soils and crowded conditions leads to disease problems and possible death.